BURBANK, CALIF. (March 5, 2013) Hollywood’s legendary El Capitan Theatre is thrilled to present Disney’s fantastical adventure “Oz The Great and Powerful” in spectacular Disney Digital 3D™ and Dolby® Atmos™, it was announced today by Lylle Breier, Senior Vice President of Worldwide Special Events for Walt Disney Studios Motion Pictures. 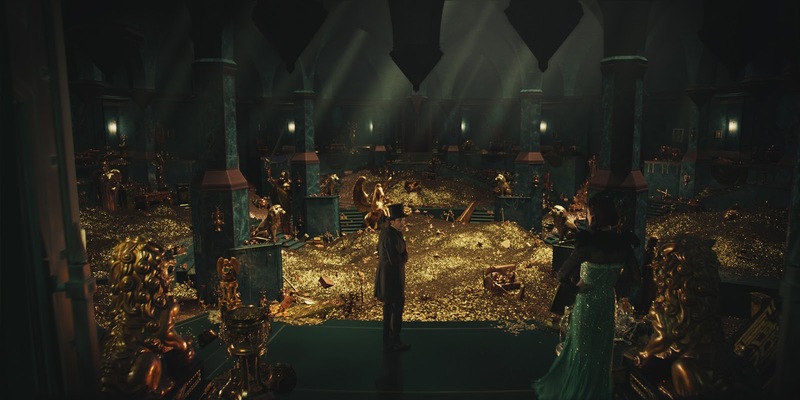 “Oz The Great and Powerful” will have a special advance screening for the public, with prizes, on Thursday, March 7 at 8:30 pm (doors open at 8 pm); the El Capitan engagement of “Oz The Great and Powerful” is through April 30. The film, directed by Sam Raimi, imagines the origins of L. Frank Baum’s beloved wizard character. El Capitan guests will also get to see an exclusive display of costumes from the movie. For the first three weeks of the engagement – through March 31 – audiences will get to experience Disney “Mysteries of Magic” at every show with award-winning magician Greg Wilson performing traditional magic of all kinds live on the El Capitan stage. Daily showtimes for “Oz The Great and Powerful” are 10:00 a.m., 1:15 p.m., 4:30 p.m., 7:45 p.m. and 10:55 p.m. (select dates.) Tickets are on sale now, and available at the El Capitan Theatre (6838 Hollywood Blvd. ), online at www.elcapitantickets.com, or by calling 1-800-DISNEY6. Group rates for parties of 20 or more are available by calling 1-818-845-3110. Showtimes subject to change. Classically trained in all forms of the magical arts, Greg Wilson is well known, not only for his Sleight-of-Hand and Grand Illusions, but also his incredible Close-Up table magic, and all styles in-between. Wilson just returned to the USA from Japan, after yet another tour, including performances at the famous Billboard Live Nightclub in Tokyo, then in Yokohama on the Royal Wing Dinner Cruise-ship, and again in Tokyo & Osaka for the “Kidzania” Annual Gala. Wilson, who performed on “The Mickey Mouse Club” as a child, is the son of famed American magicians and entertainment producers Mark Wilson and Nani Darnell—“The Magic Land of Allakazam,” “The Magic Circus,” and “The Magic of Mark Wilson.” Because of Greg's unique talents, training and upbringing, he has been on stage and television since he was 6 years old. Greg Wilson has starred in countless television specials on all the American Networks, and abroad. Greg’s largest and most extravagant creation, “Super Illusion” combined the Bolshoi Circus & Greg’s team of American artists—totaling more than 100 performers and a menagerie of animals. Disney’s fantastical adventure “Oz The Great and Powerful,” follows the journey of Oscar Diggs (James Franco), a small-time circus magician with dubious ethics, who is hurled away from dusty Kansas to the vibrant Land of Oz. He thinks he’s hit the jackpot—fame and fortune are his for the taking—that is until he meets three witches, Theodora (Mila Kunis), Evanora (Rachel Weisz) and Glinda (Michelle Williams), who are not convinced he is the great wizard everyone’s been expecting. Reluctantly drawn into the epic problems facing the Land of Oz and its inhabitants, Oscar must find out who is good and who is evil before it is too late. Putting his magical arts to use through illusion, ingenuity—and even a bit of wizardry—Oscar transforms himself not only into the great wizard but into a better man as well.